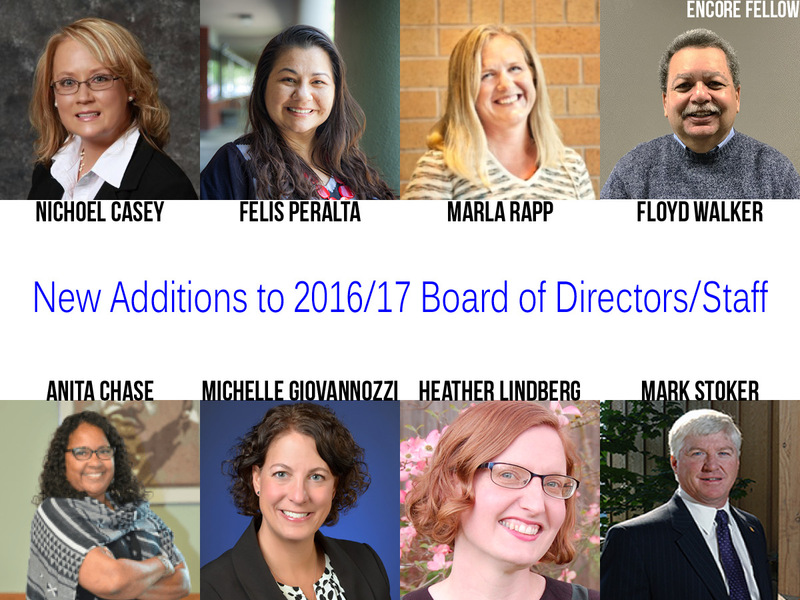 The Foundation for Vancouver Public Schools (VPS) announces additions to its board of directors for 2016/2017 and welcomes an Encore Fellow to its staff. Joining the board of directors are Nichoel Casey, Assistant Vice President, Risk Consultation and Compliance Officer, Umpqua Bank; Felisciana Peralta, Adjunct Professor and Director of Student Inclusion and Equity Services, Clark College; and Marla Rapp, community member. Beginning terms as ex-officio officers are; Anita Chase, Associate Principal, Lieser Campus; Michelle Giovannozzi, Vice President, Vancouver Public Schools Board of Directors; Heather Lindberg, President, Vancouver PTA Council, and Mark Stoker, Director, Vancouver Public Schools Board of Directors. “We are very fortunate to have these outstanding individuals join our board. They bring a wide range of skills and experience. Equally important is the passion that they have for serving the needs of Vancouver’s students. The quality of individuals on our board reflects the high level of support for public education in our community,” says Nada Wheelock, Executive Director. “As we continue to grow our board membership, we look to leaders who can guide us through a critical period of increased funding and support to Vancouver Public School students,” adds Wheelock. In September 2016, Floyd Walker III joined the staff of the foundation as an Encore Fellow. The Encore program, administered through the Portland office of Social Venture Partners, matches seasoned professionals with local non-profits for a 1,000-hour project along with a stipend. Walker’s former employer, Intel, covers the stipend. As a senior programmer and analyst with Intel, Walker gained extensive experience analyzing and solving technical issues. He is working with the foundation to improve the quality and accessibility of data for reporting and analysis. “Bringing on Walker as an Encore Fellow was a perfect solution to a pressing problem. The projects are high priority and will have a long lasting impact to help the foundation build capacity,” says Wheelock. The Foundation for Vancouver Public Schools is an independent, 501(c)3 educational non-profit corporation established in 1988 to support Vancouver Public Schools (VPS). Governed by a volunteer board of directors made up of business, community, and education leaders, the foundation creates opportunities to cultivate and inspire student success. As an educational non-profit entity, the foundation serves students at all 37 VPS schools and programs, providing direct aid to students facing learning barriers due to economic need, as well as financial assistance for learning enrichment and mentoring programs that cannot be funded by the school district. The Foundation for VPS is supported by donations from school employees, parents, students, community members, and businesses. Click here for more information on Foundation for VPS directors and staff.